Dmitry Koltakov claimed his third FIM Ice Speeedway Gladiators World Championship in 2018, adding to the titles he won in 2015 and 2017 with his most dominant campaign yet. The 28-year-old kicked off the season where he left off last year, taking back-to-back victories in the opening two rounds in Kazakhstan in front of 4,500 spectators at the Alau Ice palace in Astana. After dropping just two points on the first day he then produced an unbeaten seven-ride maximum in the second round to set the tone for the season. Another unbeaten maximum on home ice in Togliatti stretched Koltakov’s points advantage but he was pegged back on the second night at the Anatoly Stepanov Stadium by compatriot Dmitry Khomitsevich, who snatched victory in the Final on the last lap. Koltakov produced further maximums on German soil in Berlin and Inzell before he wrapped up the title in the Netherlands, where victory and the title was confirmed as early as Heat 13 when he beat nearest rival Daniil Ivanov to move out of reach in the championship. Still the fans came in their thousands for the second night in Heerenveen and they were treated to another Koltakov masterclass and another maximum score - his sixth of the series. Whilst the Russians again claimed the top three positions in the championship there was an impressive debut from Sweden’s Martin Haarahiltunen, who won his first ever race on the opening night in Astana and finished fourth overall. However, it is Koltakov who remains the Ice King, with three gold and three silver medals from the last six years. 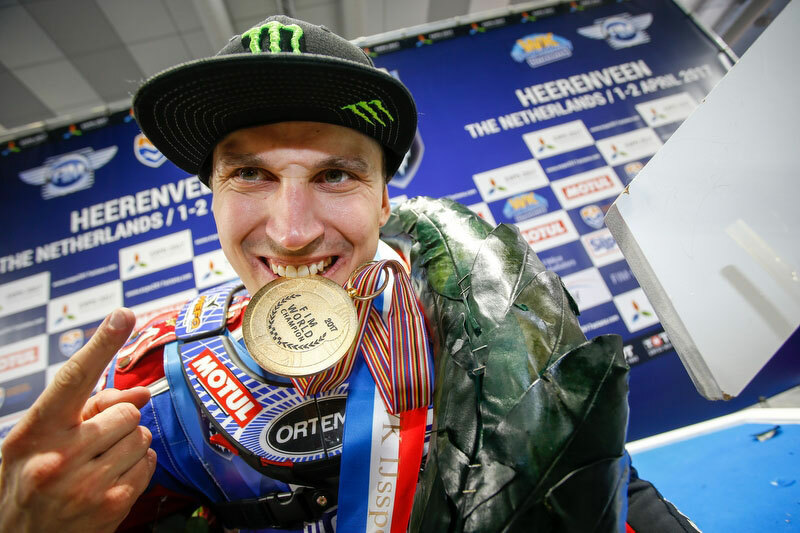 After surrendering the FIM Ice Speedway Gladiators World Championship title by just one-point last season, Dmitry Koltakov was back to his best in 2017 and he regained the crown in fine style. Last year's champion Dmitry Khomitsevich opened his defence in Togliatti against the usual strong opposition from Russian compatriots and a glut of young Swedish riders leading the resurgence of the sport in Scandinavia. In the end he conceded just a single point to Koltakov after two days of racing in temperatures as low as minus 17 degrees, which made the ice brittle and track conditions testing. One week later Shadrinsk in the Kurgan Region of Russia welcomed the series to the Torpedo Stadium for the first time with even lower temperatures of minus 25 degrees and here it was Igor Kononov who came out on top on both days, moving to within 5 points of the leaders. Then on to Kazakhstan and the highest stadium in the series at Almaty, where weather problems prevented practice and restricted racing on the first day. Again Kononov took charge, winning both events to edge closer to Koltakov. Kononov's resurgence was short-lived however as the championship moved into Europe and Berlin, where Koltakov dominated to increase his lead to eight points, beating Kononov three times as Khomitsevich slipped further behind. Finally, the competition visited another new venue, the Thialf Stadium in Heerenveen, Netherlands, which produced exciting racing under cover and a double World Champion in Koltakov, who secured his second title with an unbeaten display over two days until a fall whilst leading the final spoilt his maximum bid.